Additionally, this tome includes information on: breaking sterotypes; detailing the villain's motivations, obsessions, goals and schemes; and choosing the villain's alignment (and why good-aligned villains are not only possible, but plausible). Detailed emotional archetypes, suggestions for villains and experience, supernatural villains, familiars and many different types of villainous organizations (including assassins' guilds, black marketeers, raiders and more) give the Dungeon Master, or the evil player character, a wide variety of new ideas and role-playing insight. Furthermore, Dungeon Masters will have an abundance of information at their fingertips with which to customize any campaign setting. All officially-sanctioned, this Kingdoms of Kalamar product is fully-compatible with the revised rules for D&D. 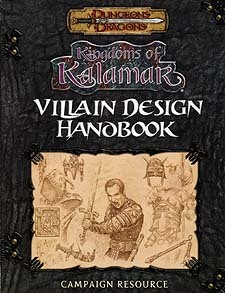 You can make use of the many features of this book in your Kingoms of Kalamar campaign or any ther d20 campaign world. New information on summoning outer planar creatures, becoming undead, hiring henchmen and and lackeys or building a lair easily ports into ANY D&D campaign. An abundant source of Kingdoms of Kalamar campaign Dungeons & Dragons material of the high quality you have come to expect from Kenzer and Company, this is one product you do not want to miss. Remember, great heroes need even better villains.